Yamantaka // Sonic Titan have always been like a tornado to their influences, sucking up a disparate series of inspirations — ranging from metal and prog rock to Chinese Buddhism, anime, performance art, the sounds and philosophies of the Haudenosaunee and New Kids on the Block's Jordan Knight — and turning them into a singular, devastating force. It's a collision of cultures that manifests itself as frustration and inclusion all at once, a loud rallying cry for the underrepresented. 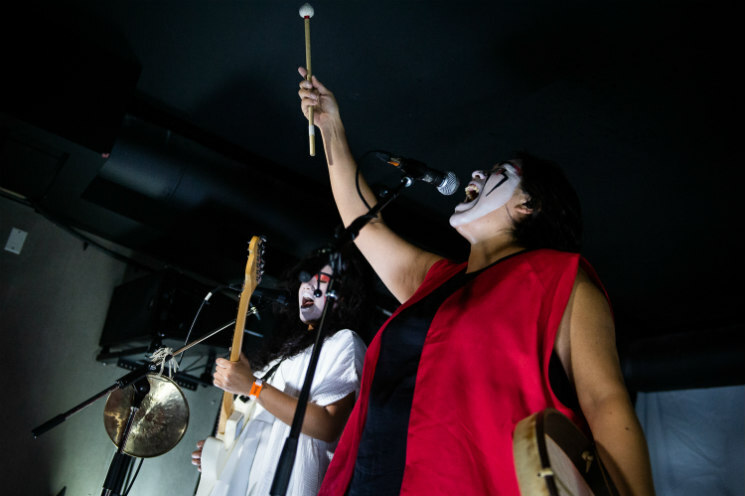 With the theatricality of performance art and the aggression of thrash metal, Yamantaka // Sonic Titan's FME set was compelling and captivating. Playing the basement of the Le Petit Théâtre du Vieux Noranda, the sextet skilfully doled out many tracks from their recently released third album, Dirt. Ange Loft's operatic vocals were balanced nicely by Joanna Delos Reyes' more understated rock style, and there was plenty of riffage from guitarist Hiroki Tanaka and his Flying V. The band's prog sensibilities came through with Brendan Swanson's keyboards, while drummer Alaska B and bassist Brandon Lim held down the rhythm section to anchor the lofty tunes. From the propulsive groove of opener "Dark Waters" to the sing-along hooks of "One," from 2013 sophomore album Uzu, each Yamantaka // Sonic Titan song is intricately constructed, with plenty of moving parts that the sextet expertly navigated live. Speaking with the band earlier in the day, they vented their frustrations against the byzantine world of the Canadian music grant system, a large reason why they've been unable to incorporate the elaborate sets and imagery that their high-concept music begs for. They've overcome that hurdle by focusing on their technically challenging, hook-laden music, leading to a nevertheless impressive live set.